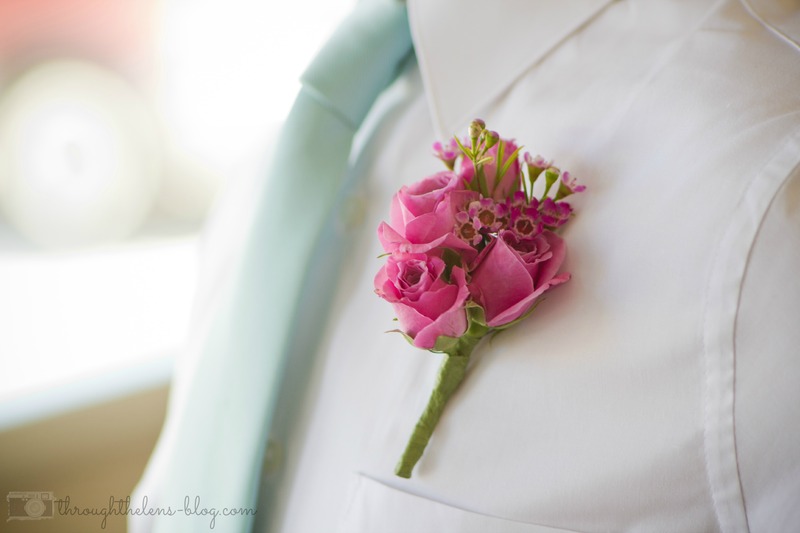 Today for Wedding Wednesday, I want to share with you our flowers in the boutonnieres and bouquets. Thanks to Pinterest, I knew exactly what I wanted for all the bridesmaids. Just a simple bunch of baby’s breath. Rustic, vintage and so cute! Let me just say, it was very heavy for a bunch of flowers. Ha! The groomsmen & ushers’ boutonnieres were the same little roses that dotted my bouquet, surrounded by a sprig of a tiny pink flowers. 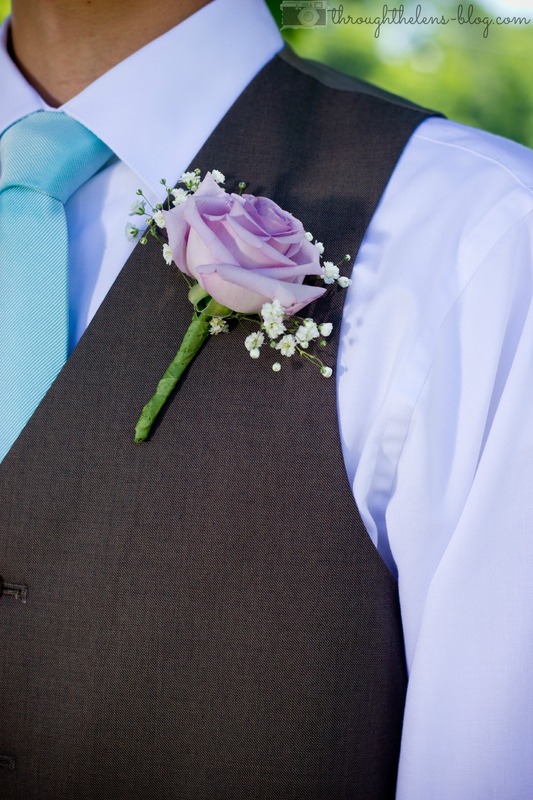 Luke’s boutonniere was one large lavender rose with baby’s breath around it. I seriously loved his! 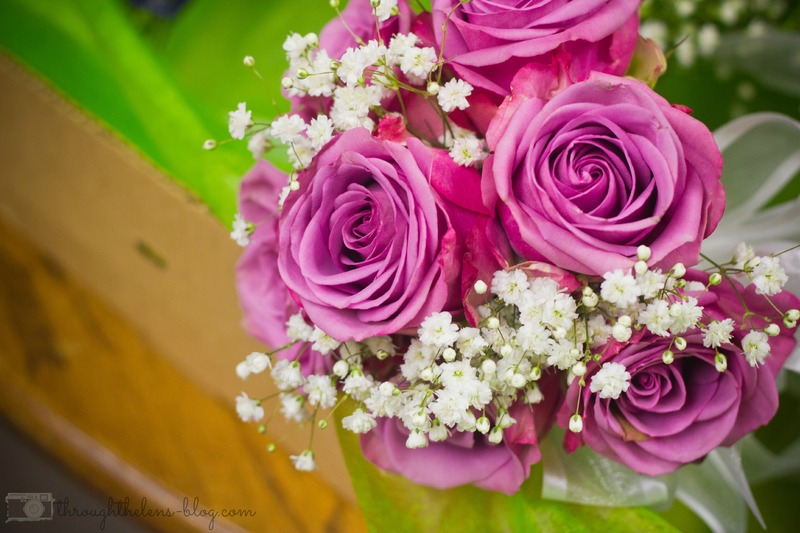 And last but not least, my throw bouquet was large purpleish/pink roses with baby’s breath. Simple and smaller than my real one. Ha! 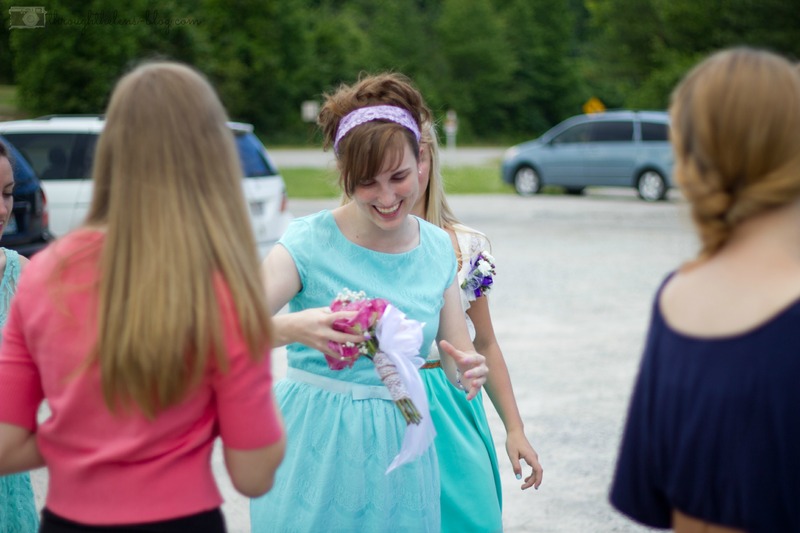 For the tossing of the bouquet, my dear friend, Olivia, was hiding in the back. She did not want to catch the bouquet, poor soul. But, I threw that bouquet right over the rest of the girls and straight to her. It was a moment of lots of laughter!! Ohh gorgeous colors! I love the teal dresses with the cowboy boots! One of my favorite color combinations is teal/baby blue and brown! Thanks for the ideas!!! How beautiful! I love the colors, but most of all I love how delicate they are! 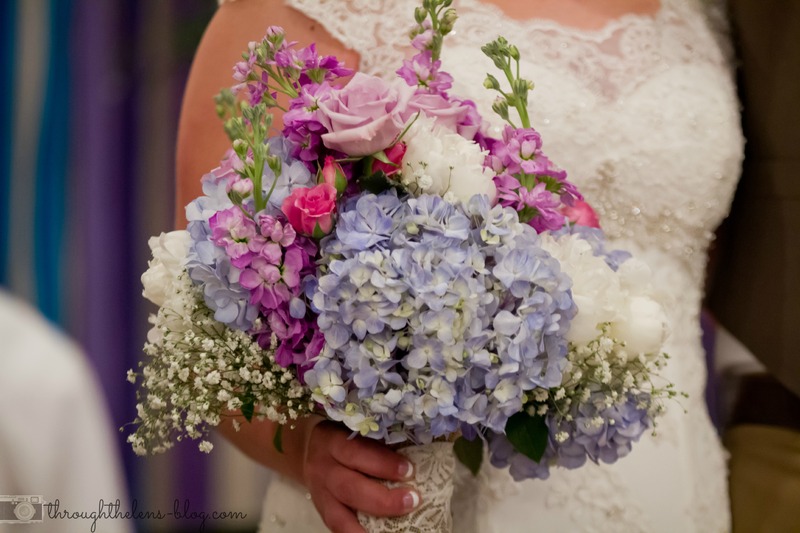 beautiful flowers and color choices! That top picture is absolutely gorgeous! I love the dresses, the boots, the flowers, but my favorite has to be the tulle (?) under your dress. Beautiful! Absolutely LOVE the flower choices, especially your bouquet and even the groomsmen’s little roses. The colors were fantastic!! Thanks so much for linking up with us this week. If pinterest was around when I got married, oh man would I have been in trouble! I did something similar with my flowers. 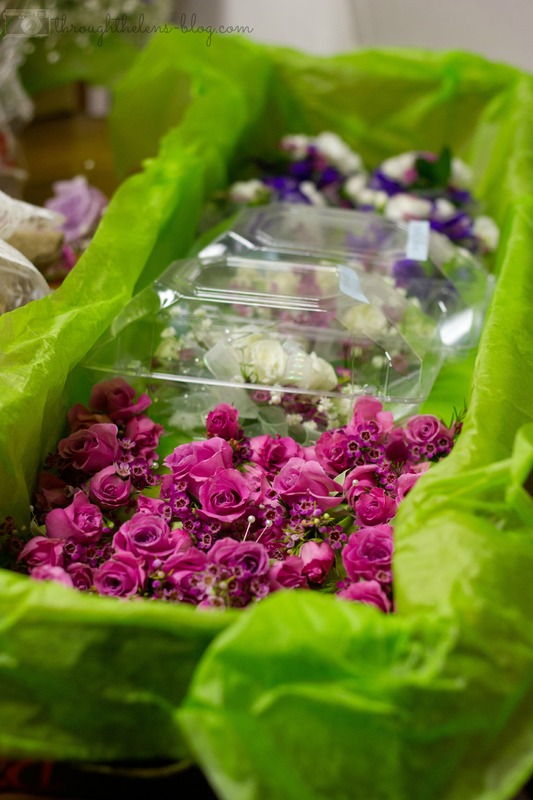 My bridesmaids had blue and white hydrangas and peonies and I had bright pink peonies. I say life is too short to carry boring white flowers b/c you’re the bride! Gorgeous flowers! And yes, Pinterest was the best for wedding inspiration. These are all so pretty. I had hydrangeas in my wedding and loved them. I wish Pinterest had been around when I got married in 2007. It makes me feel old to say I got married before Pinterest, I just got married young. I know my wedding would have been completely different had it been around then.